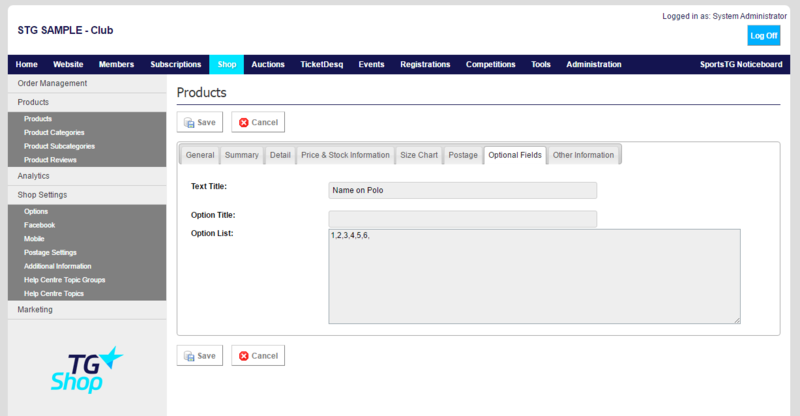 Administrators have the option of setting up two custom fields to collect information from a customer next to each product. This is in the form of one text field, and one dropdown options field. 3. Click on Edit next to the product that you wish to make changes to. 4. Go to the Optional Fields tab. 6. Once you have updated the options, click Save. Note: Optional Fields allow you to collect further information from a customer in regards to a product that they are ordering. You can also use Personalization to allow customers to add names and numbers to their product.